Aloha! 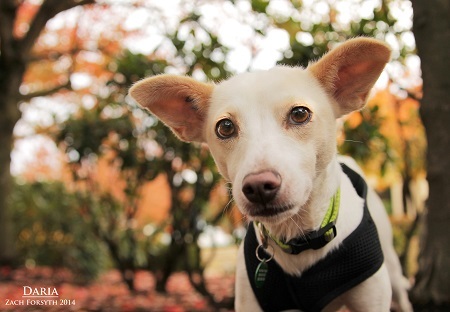 My name is Daria and I’m a darling 3 year old Chihuahua/Italian Greyhound mix fresh off the island of Maui. I know, I know, people think it’s a tropical paradise and why would I ever want to leave the warm wind and sandy beaches? Well it’s simple, my perfect family isn’t on that island! I know I’m going to find them right here in Portland. So far it’s a beautiful place, I didn’t know leaves had so many colors! I’m really looking forward to spending time with my new folks going on walks and visiting all the different coffee shops. I’m hoping to have a canine buddy to pal around with too, you know, to show me the ropes from a doggy perspective. I can get a little nervous on my own, so a canine sibling would be the best! I am great with all people and with my spunky personality all people think I’m great too! So what do you say? Want to show this Hawaiian what it’s like to be a Pacific North Westerner? Fill out an application at pixieproject.org so we can schedule a meet and greet. I am fixed, vaccinated and microchipped. My adoption fee is $250.